I recently parted ways with my 2007 X3, and traded it in with the winter set still on it. Now I'm left with the OEM Wheels and New(er) Tires. - The tires were purchased last July from TireRack, then used until October, when the winter-set went on. They covered approximately 5,000 Miles. - They are Continental ContiProContact Tires. They cost me upwards of $1,000 less than a a year ago. 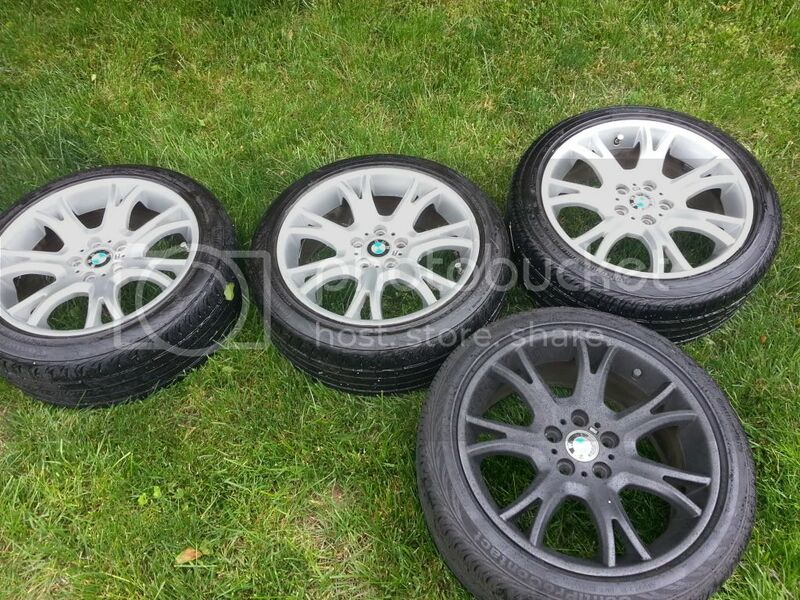 - Aside from rocks stuck in the grooves and a little curb damage on one, they are near perfect. - These wheels have probably covered only about 45K since purchase in 2007. The car was sold with 105,000 Miles, but the Summer Set was only on for a few months a year. - Each of them has some wear along the corners, or in the form of scratches on the front. However, one of them is pretty beaten up (note picture). A chunk of tire is taken out of it, but is does not effect the structural integrity of the tire. - One of them is currently Plasti-dipped. It is in good condition, but I am willing to plasti-dip all of them at little cost if you are interested. - I am in the Baltimore, MD Area and I can be available if you want to pick them up. - I can't drive them anywhere unless I do it in trips - I can't fit these wheels in my Volvo. - These things are big and heavy. I would be willing to ship them, but it would be up to you to get rates and whatnot.